CLICK here for high resolution printable trail map (1.38 MB). Jirisan is the largest and oldest of Korea's national parks. Founded in 1967, the park has an area of 440 km2. The mountains of Jirisan are part of the Great Baekdusan Mountain Range which extends all the way into North Korea. The primary ridge in the park runs East-West from Sancheong County in South Gyeongsang Province to Gurye County in South Jeolla Province. Traditionally, the mountain was thought to be one of the three places in which God dwelled. Fourteen of the highest peaks in Korea are located along the ridge at Jirisan. Cheonwangbong (1,915 m) is the highest peak in the park and the second highest in South Korea. Other major peaks in the eastern area of the park include Sseoribong (1,642 m), Jungbong (1,875 m), Jeseokbong (1,806 m), Chotaebong (1,704 m), Yeongshinbong (1,652 m), and Deokpyeongbong (1,522 m). The eastern half of the ridge is higher on average than the western half. Jirisan's large area accommodates a lot of hikers without it feeling as cramped as the smaller parks. Even so, you will probably never get a peak to yourself for longer than a few minutes. The park is a popular destination with serious hikers and those who wish to do multi-day treks. It's possible to hike the entire ridge in 2-3 days, spending one or two nights in shelters on the mountain. The weather on the ridge is unpredictable and the area is frequently enveloped in low clouds. Since it's nearly impossible to predict if there will be good views from the top, the only way to find out is to climb up and take a look. Korea's winters are drier than the rest of the year, so there's a greater chance of clear skies during that season. The park is famous for its blooming royal azaleas in the spring, best seen on the hillsides around Seseok Shelter. The Daeseong Valley and the road to Ssanggyesa (temple) are both known for their cherry blossoms. Jirisan is also a popular winter hiking destination. (7) Baengmudong Village in the north. A trailhead also exists at Chuseong Village in the north, leading south to the ridge via the Chilseon Valley, but a portion of this trail is currently off-limits to allow restoration of the natural environment, making it impossible to reach the ridge. All of the tourist villages at the entrances listed above have minbak 민박 and shikdang 식당 (restaurants). Some have small motels (모텔), inns (여권) or hotels (호텔). The Hadong area around Ssanggyesa is probably the most developed, but it's also the farthest from the main ridge. Rooms (방) in minbak typically run between W20,000 and W30,000. Don't just accept the first offer. Try to bargain down the price, especially if the room looks shabby. Insist on clean bedding. Many minbak owners don't bother to wash the quilts and blankets between guests. The food in most national park villages in Korea is nothing to write home about. Often a locale is famous for a particular dish and that dish will be the focal point of every single restaurant in the vicinity with little or no variation. It's not uncommon for a string of restaurants all to offer exactly the same menu. In general, though, one should be able to get a decent meal for W6,000-8,000. Campgrounds vary from a rough patch of dirt with an outhouse to nicer spots with picnic tables, cooking areas, and rest rooms. Campgrounds at Jirisan cost W3,000-7,000 per night. Call the park office to make reservations. Shelters vary in comfort level and the services they provide. You must pack in your own food and bring your own backpacking stove and fuel if you plan to cook. A Thermarest or sleeping pad is definately nice to have, but a sleeping bag isn't necessary. Ear plugs are advisable if you are bothered by snoring (which can be absolutely horrible). With the exception of Chibanmok--the smallest and simplest of the shelters--reservations are required 2 days to 2 weeks in advance. The park service is trying to crack down on people who show up unnannounced and request sleeping space. Foreigners can get away with it, but it's not really fair to the shelters who have to find places for you to sleep on the spot. The on-line reservation system has recently been updated to accommodate English-speaking foreigners. Simply click on the link below and follow the directions on the page. The park service will confirm your reservation by email within 1-2 days. Some of the large shelters, such as Jangteomok, often have space even at fairly busy times, so it may be possible to stay there without making reservations. Chibanmok is a small, simple shelter with a sleeping room that accommodates about 20 people comfortably and perhaps up to 40, if necessary. It has simple wooden bunks without mattresses or pads. Blankets are available for rent for W1,000 each. There is an enclosed porch area for cooking and eating (bring your own stove). Three outhouses and a compost disposal area for food waste are nearby. Fresh drinking water is available at a tank about 100 meters from the shelter. There is no phone at this shelter, but the caretaker has a walkie-talkie that he uses to communicate with the park service below. Chibanmok runs on solar electricity, so during long periods of cloudy weather, the shelter is without power. This shelter is first-come, first-serve. No reservations are required. Rotari is a small, basic place with room for only about 35 people. Jangteomok is a large facility, accommodating as many as 135 people. The shelter sells basic snack foods, rice, canned meat, coffee, stove fuel, and other necessities, and rents bedding. Blankets are not washed very often due to the cost of taking them down the mountain for laundering. The shelter is heated--often excessively so. It's useful to have a change of really light clothing to sleep in, otherwise you will bake. Drinking water is located at a spring on the slope below the shelter. Most people, who want to see the sunrise from Cheonwang Peak, stay overnight at Jangteomok. Most lodgers awake early to make it up to the peak before dawn, so taking an alarm clock is probably unnecessary. The commotion will wake you up. Seseok is the largest and nicest shelter in the park and looks like a mountain lodge. The facility sleeps as many as 190 people. There are substantial bathroom facilities and a store. Drinking water is located at a spring down some steps below the shelter. This shelter is slightly smaller than the previous two, accomodating about 120 people in three sleeping rooms. There's a small lobby area where additional people can crash if no beds are available. Guests sleep on wooden bunks without mattresses or pads. Blankets can be rented for W1,000 each. Drinking water is located at a spring around the right side, just down the slope from the shelter. The Chilseon Valley Trail from Biseondam to Cheonwangbong is closed until 2015 to allow the "last virgin forest" in Korea to recover from the environmental impact of careless hikers. Thank you so much for this information! 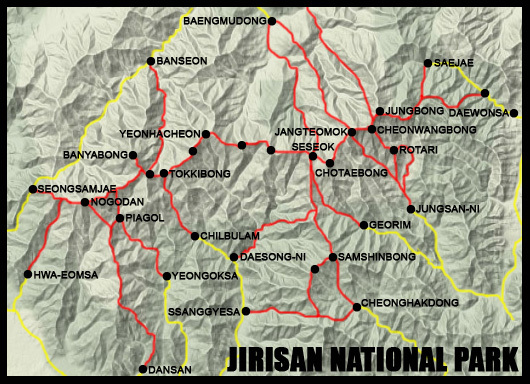 I am planning on hiking all of Jirisan in May and it was really difficult to find information on it - until I found your site. Thanks again!